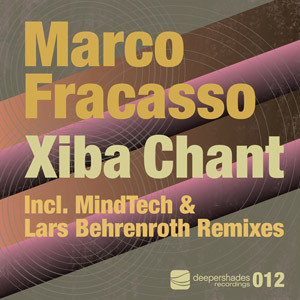 Marco Fracasso, one half of Italian production crew MindTech (featured on the Salvatore Agrosi “Spirit EP“ available on Deeper Shades Recordings), delivers his first solo project. His afro tech production "Xiba Chant" is entwined with deepness and edge built around a catchy African chant, hypnotic percussive beats and signature MindTech stabs. The “Main Mix” brings all the elements together in a hedonistic entrancing dancer’s workout that builds and then explodes in the second half while the “Deeper Rub” strips it all down and is essential as a DJ tool with a dramatic break. Much like on Salvatore's solo release, MindTech join forces to create an ancestral, deeper tech, stab laden version with their MindTech Solar Remix. Lars Behrenroth, with his 11 minute re-interpretation, creates tension in the dub mix with a swirling, filtering pad line and driving, percussive groove which builds and layers throughout, and deceptively locks you in, taking you on a journey through his mind. Concluding this release, Jojoflores has taken his favorite parts of Lars Behrenroth's Dub Mix and molded a re-edit aimed solely for the dancefloor. The Mindtech Solar Rmx and Deeperub are my choices for this one.. Good Stuff. Lars and his Deeper Shades deliver another good release full of afro grooves. All versions are worth a play and my fav is the Deeper Rub, as it does not use too much of the vocal. This package definitely brings the Deeper Shades vibe that will be rocking the clubs. The main treatment mix is the one for for me. Must say this one is great for the floors!!! Sweet project! I like the Lars Behrenroth remix the best. Super groove! Can't wait to hit this week at my gigs. treatment and Lars Behrenroth Dub- this is on my playlist this weekend. Really feeling this one. Luvin both Main treatment and Lars Behrenroth mixes "Very Nice Afro Teky for the Deeply Minded"
I was wondering when the next Deeper Shades would arrive. And as always you don't let me down. Really feeling the techy deep tribal groove on the Main Treatment Mix. Great groove overall that does the job. Full support on this one. Keep up the great work.